The Housebuilding Camp was sooooo much fun! We followed my planning notes and it worked really well. I only added in one thing on Thursday, when we talked about the Ocean biome and the Kon-Tiki raft exploration led by Thor Heyerdahl (discussed in House by Albert Lorenz). 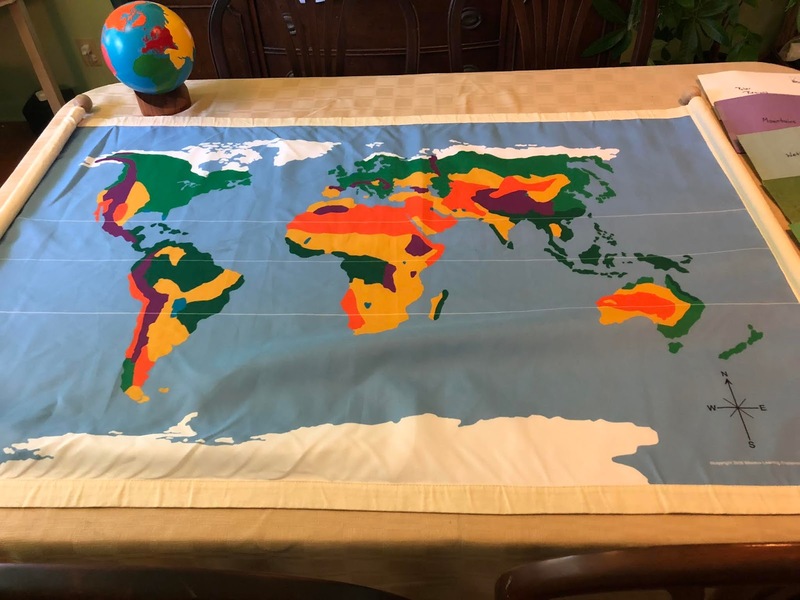 I showed them the Journey of Mankind: The Peopling of the World interactive timeline/map put together by The Bradshaw Foundation. Very interesting! Here are photos of the work in progress and the finished museum. Note that the displays are set up on colored silks which match the biome map key. It's so nice to be organized. 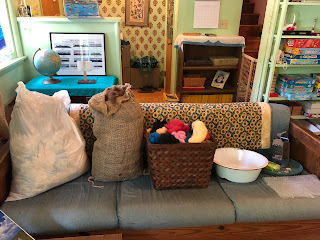 And, seriously, if you have an Early Childhood kiddo, I promise you'll be getting many years of good use from that collection of play silks. We use them in displays all the time. In Waldorf, Housebuilding is a standard Third Grade block. 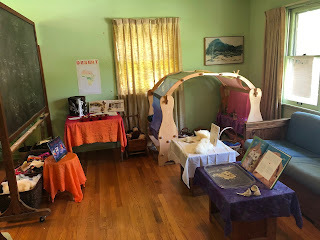 I'm happy to share all of my resource links and if I've forgotten one, please just ask. We set up eight exhibits, one for each biome. 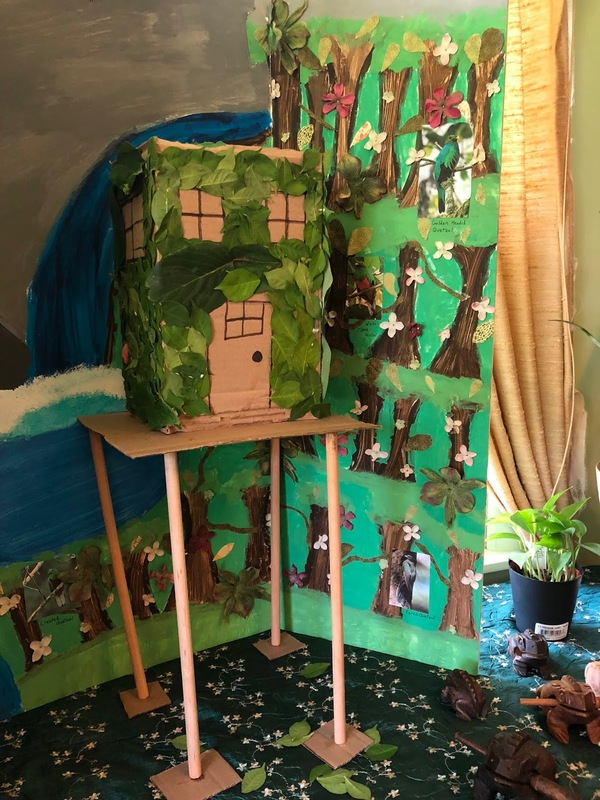 As people walked through the house, they visited each poster and model. 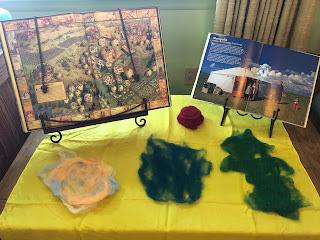 Some of the displays even had hands-on activities! Although Natalie, Leah, Becca, and I provided some support, the bulk of this work was done by my two 9 year old campers. 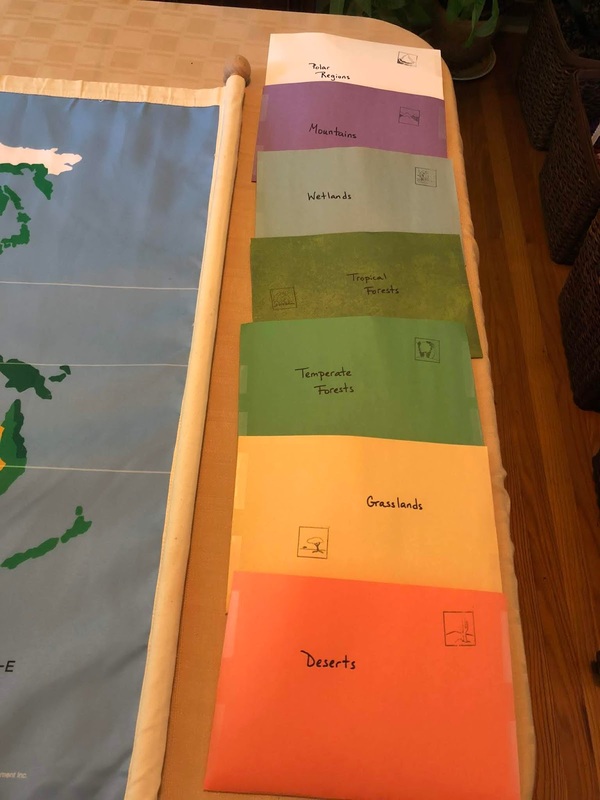 As we learned about each biome (we covered one in the morning and one in the afternoon each day Mon/Tue/Wed/Thu, with Fri morning set aside for the field trip plus the creation of the Bonus Exhibit) we laid out these Biome Cards for the Continents three part cards from Waseca Biomes. We used only the People and Shelter cards from this extensive set of nomenclature. 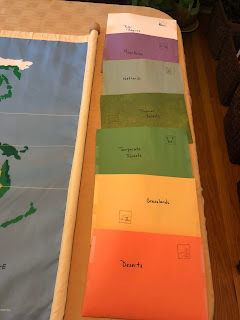 Carefully arranged by continent on the Biomes of the World Mat, one biome at a time, we could easily see similarities in building materials and styles. I displayed many of the books which we used throughout the museum, nearby exhibits that they fit really well with. 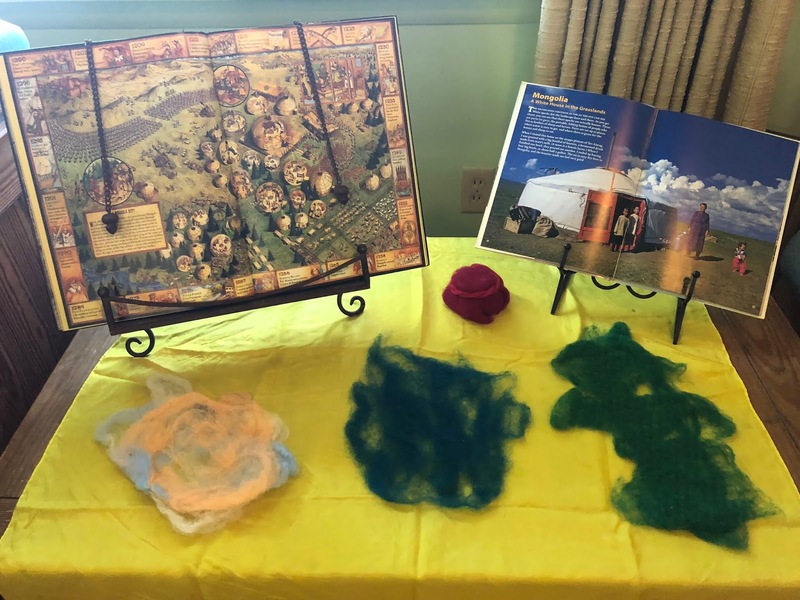 We also had some extra resource books set up on the table in the kitchen. Fun Fact: On the Kon-Tiki's expedition flying fish literally lept out of the water and onto the raft, providing a ready source of food. Explorer Thor Heyerdahl sought to prove that peoples from South America could have been the first to inhabit the remote islands in the South Pacific, so he built a simple raft using only ancient materials (no metal), left the western coast of South America and traveled on the Humboldt Current, and arrived on a small island off of Tahiti on his very first try, 101 days later. Fun Fact: Genghis Khan's enormous empire, which spread across Eurasia from the Danube River to the Great Wall of China (which he broke through), was founded using yurts! Since yurts are lightweight and portable, developed for the nomadic lifestyle, they worked perfectly for his army while traveling. Naturally, his yurt was the most luxurious of them all, and even had ropes made of silk. 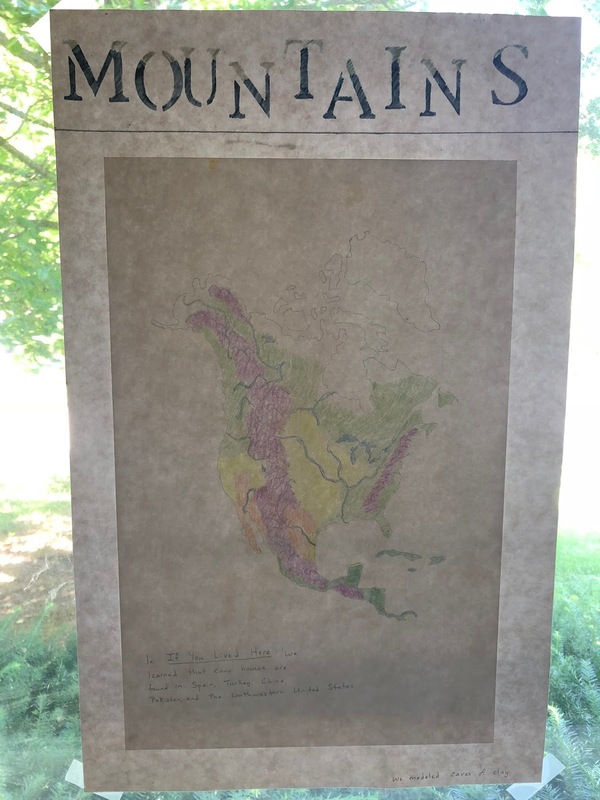 Fun Fact: I used the Continent Stencils by Waseca Biomes for North America and Africa to create my two posters (Mountains and Desert). In the biome map key, mountains are purple. 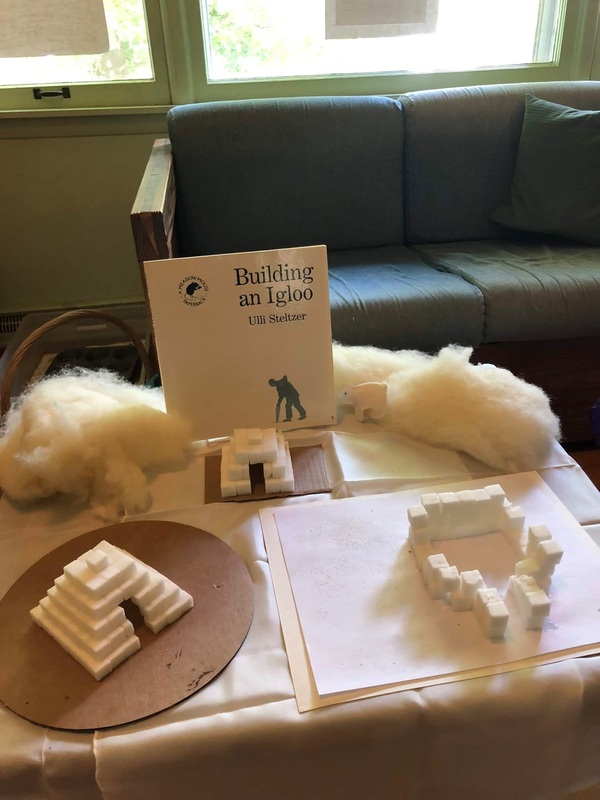 Cave houses are still lived in throughout the world, in Spain, Turkey, China, Pakistan, and the southwestern U.S.
Fun Fact: Igloos aren't nearly as easy to make as they look and the blocks need to be a special shape (as is shown in Ulli Steltzer's delightful book of photographs Building an Igloo). So when you try it with sugar cubes, it WON'T work out well. 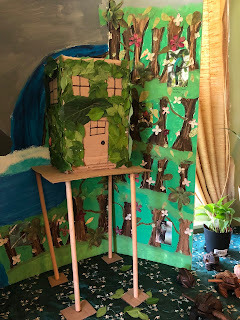 That was okay with me, because part of the purpose in making these models was to have the kids realize and respect how much work goes into each house construction method. It's not a quick process to make a piece of felt... and imagine making enough to cover your house! It's not easy to shape the blocks for an igloo, either. The little polar bear finger puppet was made by Natalie years ago. The pattern is in Suzanne Down's Around the World with Finger Puppet Animals. Note: If you do try this project, Elmer's glue will melt the cubes very quickly and make it hard to build, so go with Aleene's Tacky Glue. Fun Fact: We started this camp by reading Rain School by James Rumford, a must-have book if you're teaching about this topic! It takes place in Chad, Africa. The children work together to build their school with mud bricks. They thatch the roof. They even have mud desks. Right when the school year ends, it is the beginning of the rainy season. The school slowly melts away. And so, when they show up the next year, they build it all over again. When we did our building experiments with cob, we left some pieces outside Monday afternoon and that evening there were heavy rains. The children were very excited to go outside Tuesday morning and see if they had melted away, just like in the book. They had... so it was great reinforcement! Fun Fact: We read about palafitos on Chiloe Island in Chile in If You Lived Here: Houses of the World by Giles Laroche, as well as the water travel of Venise, Italy. Imagine taking a gondola to school instead of a school bus! An unexpected example of building in the wetlands was The Netherlands. After all, most of this country is below the water level. 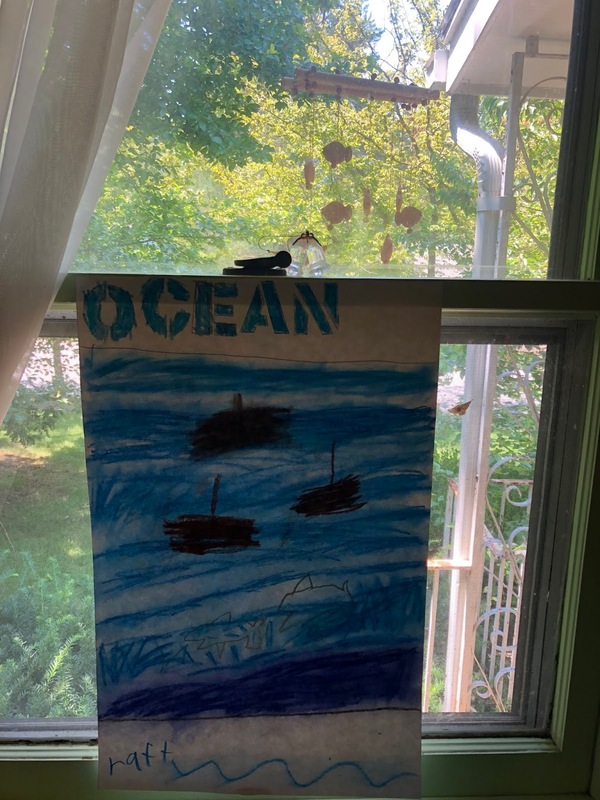 In the book by Laroche we learned about a fascinating Dutch rotating floating house, which can be turned towards the sun throughout the day to help warm the house! Fun Fact: A Ride on Mother's Back: A Day of Baby Carrying Around the World is a great resource for a block on the biomes. It has wonderful pictures for tropical forests around the world including Brazil and Papua New Guinea. Stilt houses are often found in this biome as well as the wetlands. 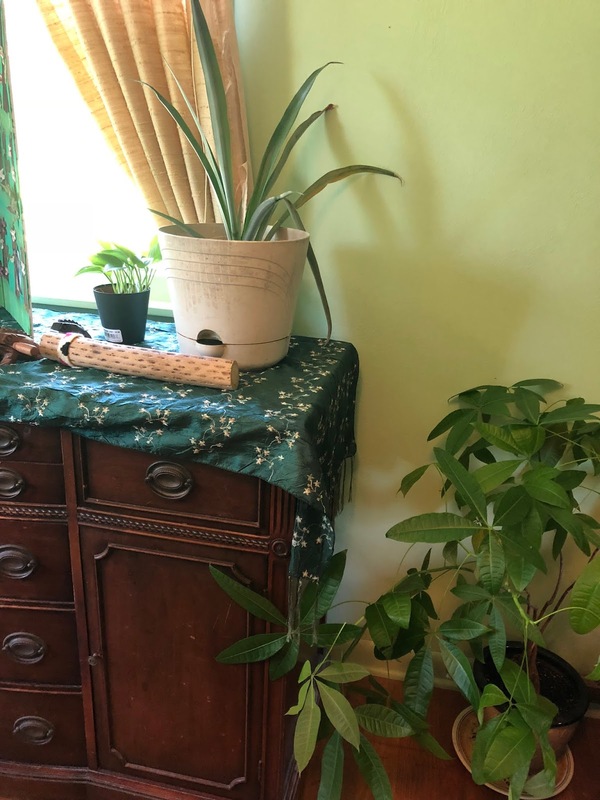 We set up a display of frog drums and rainsticks (including my awesome new 40 inch long rainstick) so that families could play the instruments all together and imagine they were in a tropical forest. It's a wonderful sound! 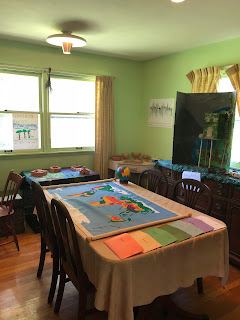 We also had the Biomes of the World Mat set up on the dining room table here, with all of the People and Shelter cards organized in color coded envelopes, so that parents and children could choose a biome and lay out the cards, just as we had done when we were learning about these shelters. Fun Fact: The inventor of the classic toy Lincoln Logs was the son of Andrew Lloyd Wright! We had the most examples of houses for this biome. We built with wonderful tiny -- but real -- bricks made in Germany. Teifoc makes a child-safe corn-based mortar and tiny masonry trowels. You mix the mortar with water (7 T powder to 2 T water) and build. If you want to reuse the bricks, simply soak your building in warm water for a few hours and the mortar will wash away cleanly. We set up a hands-on activity station in the corner with fresh mortar and an assortment of bricks and trowels, so that parents and siblings could try their hand at building too. It was a very popular activity! On the wall by the brick building activity is my Root Systems of Prairie Plants poster. 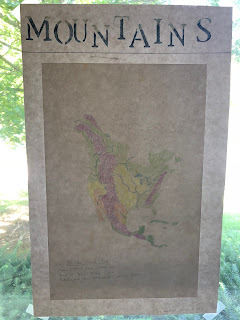 We didn't talk a lot about building with sod, although it is mentioned in Wonderful Houses Around the World (Bolivia) as well as On the Banks of Plum Creek (U.S.) but this poster is a very powerful visual. I bought it last year when we learned about the Dust Bowl and the Great Depression. we set up a station with all the supplies needed to build with our bricks! So, what was in the kitchen, hidden on the other side of the pocket door? Our field trip Friday morning was to see a style of housebuilding invented by a famous SIU professor, right here in Carbondale! 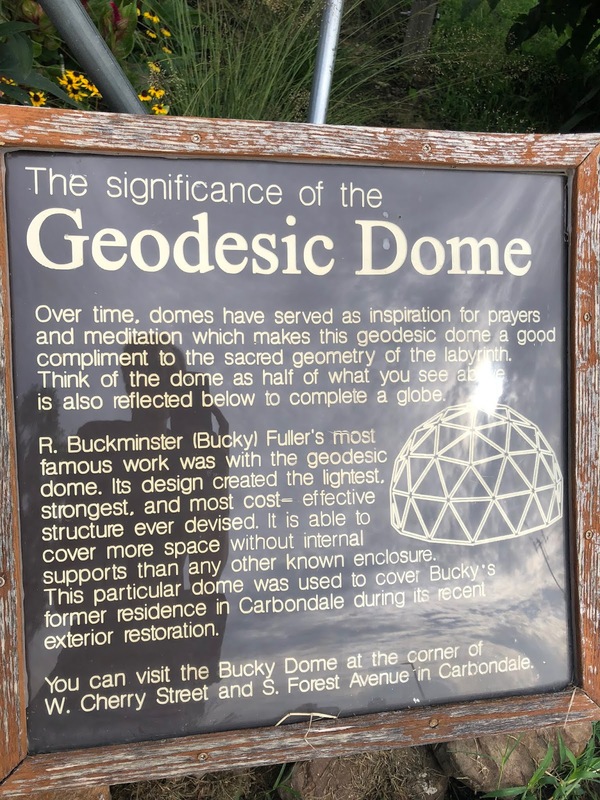 Buckminster Fuller created the design for the Geodesic Dome. Fun Fact: A geodesic dome must be built using two different lengths of struts or the math will not work out correctly. Inspired by this blog post, I purchased special 20 inch long straws for our building project. She recommends the website desertdomes.com to help you do the math. 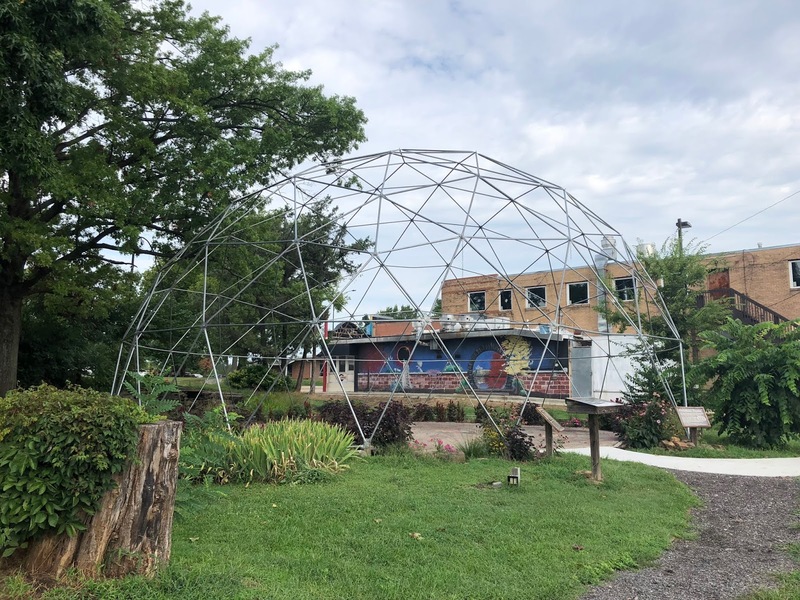 This is an amazing website which helps you build your own geodesic dome. 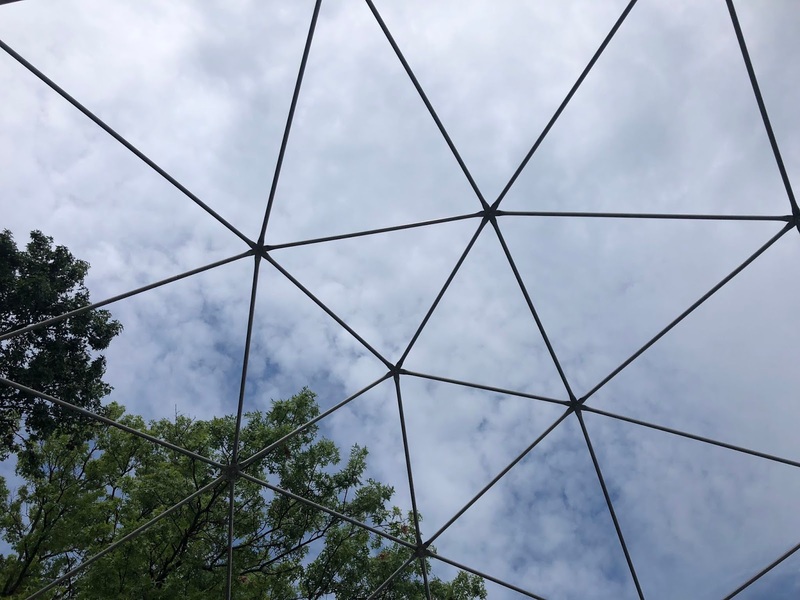 Simply put in the radius of the dome you wish to build, and it will tell you how long to make your struts and how many of each length you will need, plus how many connectors of each type you will need. 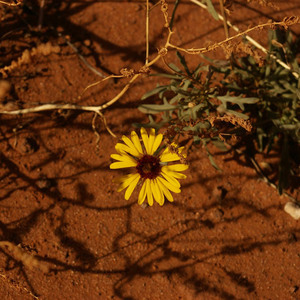 At the base you are connecting four straws and then you will alternate between connecting five straws and connecting six straws. We used paperclips linked together in little bunches as our connectors. Making the connections in advance helps. Then, they simply slide inside the straw and they stay put very neatly. Our design used 65 straws (some 20 inches and some 17.5 inches) to make a dome almost 6 feet across. Somehow I neglected to photograph it once it was complete and part of the museum, but I took plenty of pictures of the construction process. Don't forget to click on the ASSEMBLY DIAGRAM link on the webpage or you'll be tearing your hair out. Another tip: cut your two lengths out of different colored straws so you can easily tell them apart during assembly. "...the lightest, strongest, and most cost-effective structure ever devised. It is able to cover more space without internal supports than any other known enclosure." 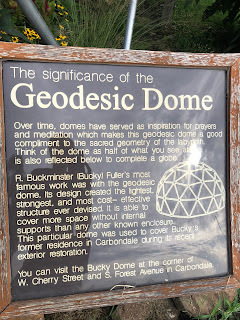 after visiting the dome, we went home to build one! a huge thank you to the creator of DesertDomes.com! DON'T try this without it! hmmm... now how do I get out of here? Several of the families then went outside to see the digging pit, and our handy-dandy blue tarp all laid out with the supplies for making cob. If you're making a big project with cob (last time I did cob we built a bench for the playground) I recommend mixing the ingredients on a tarp with your feet. It's really super fun to dance cob!!! Great activity to do as a family! 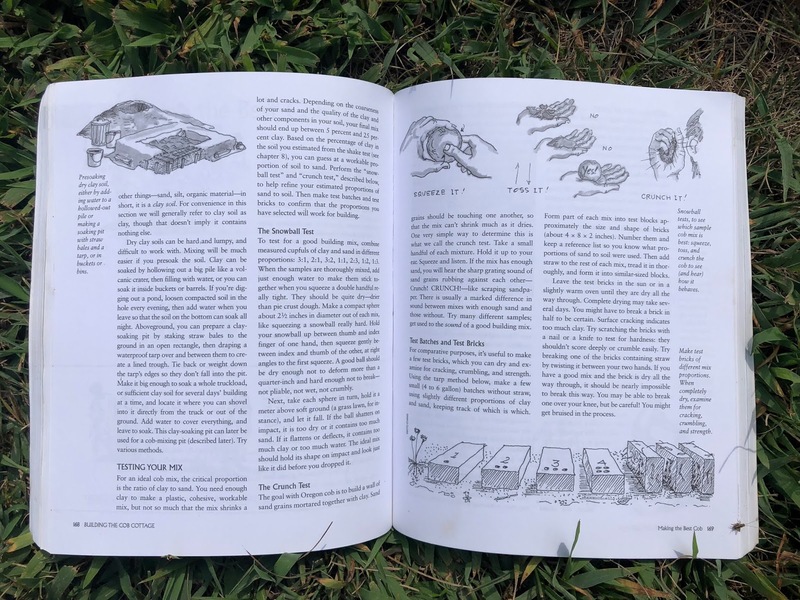 If you are seriously interested in this, you need The Hand-Sculpted House: A Practical and Philosophical Guide to Building a Cob Cottage. 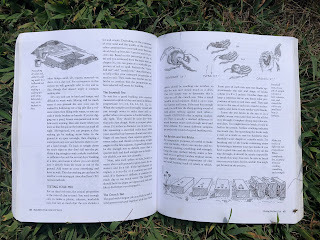 If you want to start smaller, say with a bread oven, you want Kiko Denzer's book. time to experiment with building with cob! trying to make cob was another popular activity at the museum! Thank You to both of my campers for their hard work!! And to my daughters for tackling that geodesic dome construction! !